Neema House was designed with the purpose that people from the Geita community will experience the grace and abundance of God through tangible acts of love and service. It seeks to be involved in the community and a partner with social welfare to address the needs of children in the Region of Geita. Neema House is an interim care home that was built to serve orphaned, abandoned, and at-risk children ages 0-5 in the Geita Region. It was opened in Geita Town in June 2013 and was initially set up to serve up to 20 children at a time. 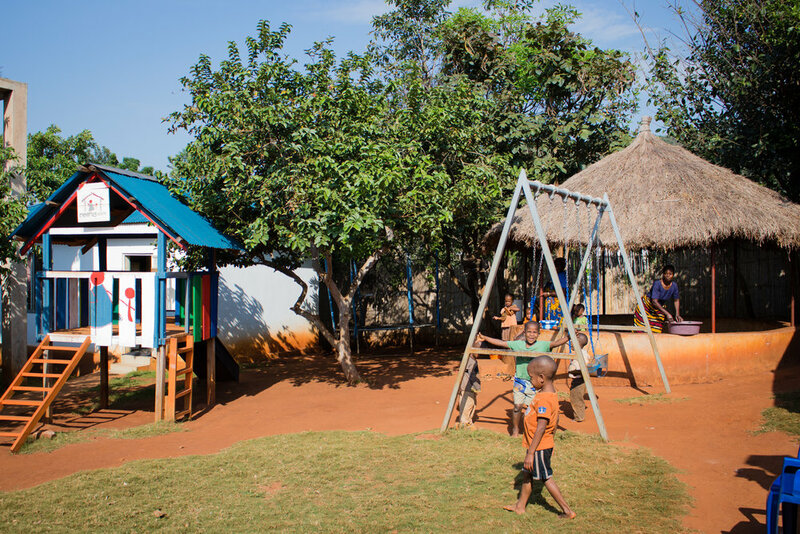 Since then, Neema House has expanded its facilities to include separate baby and toddler homes, thus increasing capacity and improving quality of care, as well as developing a classroom space for the children as well as an outdoor classroom space for community outreach trainings. Neema House is the only home in the Geita Region serving children under the age of four. Neema House works in connection with the local hospitals, clinics, and government social welfare offices to identify children in need and ensure their care and safety. While at Neema House, children are provided food, clothing, shelter, medical care, education, and love. Day-to-day care of the children is provided by Tanzanian "mamas" to help ensure that they are raised in their Tanzanian culture as much as possible and therefore more easily reintegrate into homes in the community. Though many children are orphaned due to AIDS, malaria, other diseases, or abandonment, some children may have extended family in the area. Neema House is committed to maintaining and developing a relationship with any extended family these children may have in the hope that as many children as possible may return to their homes in the future. Children who do not have additional known family will remain in the care of Neema House until further long-term plans can be arranged to ensure the child's care and safety, whether through local adoption, fostering, or other future arrangements. At Neema House, we seek to care for children when they are most vulnerable, to ensure their health and well-being, and to develop long-term plans for a safe and loving home in the community, preferably with family. When children are found abandoned or at risk of safety, we offer residential care on an interim basis until other long-term plans can be made. Neema House focuses on family reunification first and, when that is not possible, completes the necessary processes to make children available for adoption. When possible, however, we seek to offer support to families in the community to prevent the need for out-of-home care, particularly in instances of maternal death or severe malnutrition and health concerns. This support could include: infant milk formula support, nutritional counseling and support, parent / caregiver education and training, provision of mosquito nets, assistance with business start-ups for long-term sustainability, medical assistance, or other follow-up support. Through this support, we strive to meet our overall objectives at all times while working with families: reduce poverty and hunger; reduce malaria and other diseases; reduce infant mortality; improve quality of life; improve education and life skills; and improve family nutrition. Cheryl is a Licensed Master of Science in Social Work with 16 years of experience, most of which has been in child welfare and mental health, including running two homes for children ages 0-12. Cheryl has experience as a social welfare officer and also spent 5 years working in the emergency room of a children’s hospital. She oversees all of the day-to-day operations of Neema House, including community outreach. Scott has a Bachelor Degree in Accounting and is both a Certified Public Accountant (CPA) and a Certified Internal Auditor (CIA). Scott’s role is to develop a thorough system for record keeping, coordinate fundraising projects for Neema House, seek other funding sources for long-term sustainability, update and maintain the website, oversee building projects, and oversee payroll. Lucas has a Bachelor Degree in Sociology and has been working with Neema House for over a year and a half, serving as both the Manager and Social Worker. Lucas oversees staff, assists with hiring, training, and development, works with the social welfare offices on identified needs and paperwork, and oversees the community outreach program: Maisha Matters. Steven has been involved with Neema House since before it was built and was present during the planning and construction of all of the facilities. He is an all-around handy man and can build / fix most things. Steven oversees the property maintenance and improvements, supplies, and security. Lucas has a Bachelor Degree in Sociology and has been working with Neema House as Social Worker for a little over a year. Lucas completes investigations to search for family for all new children; coordinates family reunifications, when possible, and then does follow-up safety visits; and assists with our Maisha Matters outreach program. Neema has worked at Neema House for 3 years as a child caregiver. She was recently promoted to the position of Office and Education Assistant where she is working to help maintain Life Books on every child, keep photos up-to-date, and create a unique curriculum to educate Neema House children on life skills, fine motor development, and critical thinking skills in order to better prepare them for school in the future. We also employ over 25 other employees including our caregivers (mamas), cooks, and security guards. All employees receive a salary, social security, annual leave, and we hold regular trainings with our staff. 80% of our staff are women and in some cases they are the primary earner in their families. Thank you for signing up! We will keep you updated on Neema House news!